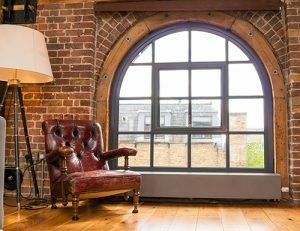 Steel Window Association (SWA) member, West Leigh, has won the gratitude and admiration of a client local to its south London premises, for the quality of the firm’s W20 window and door package which completed the renovation and re-configuration of an old Victorian tannery building. Dating from 1850, Number 3 Tanner Street in Bermondsey was purchased by Sanjay Sharma ten years ago with the intention of turning it into a permanent home for himself and his family. Despite the property having undergone a 1980s refurbishment which concealed many of the property’s original features, Sanjay and his architect could see the potential for opening up and extending the building while restoring its character. Having carried out a phase one renovation in 2008, Sanjay and his main contractor, Kraft Electrical, have now completed the transformation; with the SWA’s West Leigh having produced a bespoke package of W20 windows and doorsets to replace the old timber sash windows. Close to London Bridge station and lying within the Bermondsey conservation area, the Tanner Street property has a floor area of 5,000 sq ft, providing Sanjay with a fully open plan office on the ground floor, while the bedrooms, as well as a study and gymnasium, are on the next two levels. Then, in line with the concept of New York loft apartments, the top floor forms a striking living space where a set of W20 doors open out onto a large roof terrace, offering views towards The Shard. There are three more doorsets in the rear elevation above ground floor level, plus six double glazed steel windows; all finished in RAL 7015 Slate Grey Matt. The front elevation retains the original timber front door, but has a total of seven more W20 windows now filling the old openings. All of the frames contain 4-8-4 IG units which, with a soft coat, low-E inner leaf and Krypton gas filled cavity, provide significantly better energy performance than the fenestration they replaced. 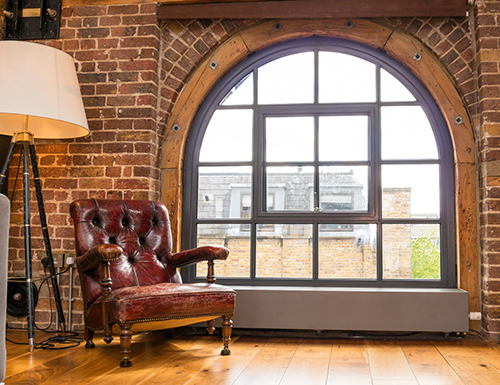 Members of the Steel Window Association offer a UK wide service for the repair and replacement of various types of old metal windows, doors and screens, as well as being able to manufacture new fenestration which fully meets the requirements of the Building Regulations. Choosing an SWA member to manufacture and install your steel windows and doors ensures that you are receiving the highest standard of fabrication, Installation and customer service.